Communication is the most common presenting problem of couples in my practice. Yet, it is not truly the main problem. Even if couples utterly fail to talk, negotiate, or make decisions, there's a bigger problem than communication. When you're in a tense, difficult or nasty discussion with your partner, the problem isn't communication. The problem is your distressed emotional reaction about what they are saying. If your distress is severe enough, you are on the way to being at your worst. When you are at your worst, you're likely to bring out the worst in your partner. But you really hope your partner will respond with their higher self. You hope they will break the pattern. Meanwhile, they're hoping that you will break the pattern. You know where that leads. But it is not THE problem. 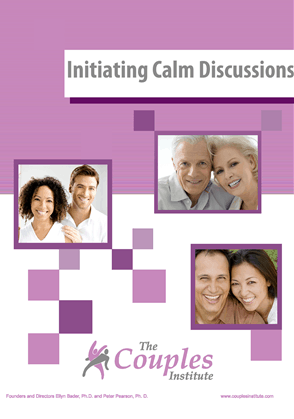 THE problem is your ineffective responses during the stressful discussion. There are a lot of variations of each of these categories but they have one thing in common. They are all painful reflexes to a difficult discussion. Because they are reflexes, they don't take rehearsal or planning. When was the last time you had to remind yourself to get defensive at your partner for being sarcastic? When you feel bad, angry, hurt, disappointed or frustrated, it's a reflex to want your partner to treat you better. If only they'd act more in accordance to your standards and desires, which bring you emotional relief, your life and relationship would be better, easier, more satisfying. There is a part of everybody that wants our partner to change first. We want them to change to relieve us from our distress. We're trying to get relief from our distress more than we're trying to communicate. This is a normal and natural desire and reflex. But when this desire becomes the foundation for relationship change, there is trouble in River City. Yes, I know you can build a legitimate case on the dastardly things your partner does when they go on tilt. That is A problem. But it is not THE problem. THE problem is improving how you react to their pain. That is what takes effort, planning and rehearsal. How hard is this concept to implement? Intellectually, I know that when Ellyn annoys me I should improve my reaction. But there is still a part of me that thinks, “Hey, I didn't get married to be reminded to take out the trash, put away my mail, pick up my shoes, etc. Why should I have to improve my response to Ellyn's distress?” Faced with the choice between leaving victimhood or proving that Ellyn needs to “chill” I get busy on the proof. Discussions with our partner are just one way we express our jumble of values, interests, concerns, goals, insecurities, dreams and hopes. The painful gap between effective communication and negative results is caused by fear, lack of self awareness, or lack of skills. Next time you're heading into a difficult discussion with your partner, take a minute to relax with a couple of deep breaths. Exhale fully so that you're forced to inhale more oxygen. Think about how you aspire to be during a sensitive discussion. If you were coming from your higher self, what would that look like? Write these qualities on a sheet of paper or a note card and have it in front of you during the next charged discussion. For more information and a live demonstration on this process, plus a specific technique to calm your emotional brain under stressful discussions, visit “Beyond ‘I Messages:' Safe and Sane Couples Communication.” There you can download an audio mp3 version of the teleseminar, “Beyond ‘I Messages:' Safe and Sane Couples Communication.” Don't be intimidated by the technology. It's easier than you think, and our staff will help you if you have questions. Besides that, we offer a money-back guarantee. If you don't think the program is worth your time and money, we'll give you a full refund.